Home to a number of sporting events, exhibitions and the home of Leinster Rugby, RDS (Royal Dublin Society) is the latest in a long line of sporting and events venues to select Tripleplay to provide its digital signage and IPTV solution. Tripleyplay's video solution at the Royal Dublin SocietyAlready in operation in the venue, the Tripleplay Digital Signage and IPTV solution is used for advertising, delivering live streamed video from the arena to televisions and displaying live broadcast TV across the 42 acre site. The solution is delivered to screens via four Tripleplay HD Encoders, 28 Amino Digital Signage Set Top Boxes, and Tripleplay Head End servers. 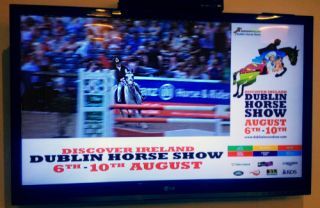 The Tripleplay solution was debuted at the Dublin Horse Show in August 2014, delivering live footage of competitors and advertising to screens around the venue, with the audience including US rock legend Bruce Springsteen who was in attendance to watch his daughter perform. Tripleplay’s Sales Manager, Tim Hoddy attended the event and was delighted with the quality of the implementation; “Seeing our solution in action is always a pleasure especially at such a high profile venue and during an event like the Dublin Horse Show. We have worked hard to develop a solution that has all of the features sporting and event venues require, at a price point that is competitive that delivers a high quality output; which is exactly what we have done here in Dublin.